Swing zone tank mixing involves designing wastewater treatment tanks and basins to handle either aerobic or anoxic zone treatment modes. 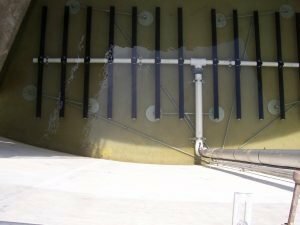 The tanks will need both aeration diffusers for aerobic treatment and a mixing system that will not interfere with the diffusers for anoxic zone mixing and that will not increase the dissolved oxygen (DO) level in the tank. The Pulsair wastewater treatment large bubble mixing systems can be installed in any size tank to provide the operator fast mixing, using less energy than tradition mixing methods and with zero in-tank maintenance. The Pulsair mixing system can be customized to fit any size wastewater swing zone tank for aerobic and anoxic zone mixing. The Pulsair mixing system is perfect for keeping the solids and accumulated sludge below the diffusers suspended and uniformly mixed in the tank without increasing. 200 food x 75 foot aerobic basin with Pulsair installed along side aeration diffusers. Contact Pulsair to learn more.